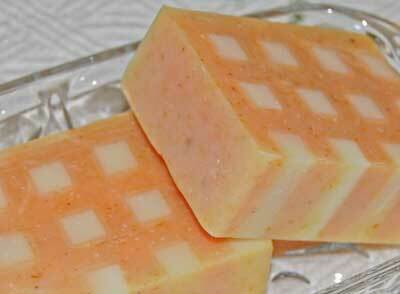 A homemade soap recipe for citrus lovers. Fresh and tart with a great lather and an awesome checkerboard design. Naturally scented with essential oils and naturally coloured using Red Palm oil** and calendula petals. Take note that this recipe uses only 650 grams of base oils rather than the full 900 grams my recipes usually use. This is to make room for the 300 grams of soap strips needed to create the checkerboard pattern. If you do not want to add the pattern, be sure to adjust the recipe size. To make this recipe Palm Free, simply switch out the palm oil for lard, tallow, shea butter, cocoa butter or mango butter and re-run the recipe through a lye calculator to get the proper amount of sodium hydroxide (lye). Remember that the soap will not be as yellow as pictured if you do this but you can always add a yellow colourant to the soap base such as annatto or turmeric before pouring. Distilled Water - 214.5 gr. | 7.57 oz. Lye - 93.25 gr. | 3.3 oz. You can make the base for this recipe following the instructions for either cold process soap making or room temperature soap making and incorporate the following steps. If you plan on making this soap with the checkerboard pattern, make a plain batch of soap or use some you already have and cut it into strips as outlined in the link above. Once you have filled your soap mould with the soap strips and are ready to make the soap base, warm your oven to it's lowest temperature and then turn it off. Be careful not to let the oven get too hot or the soap strips will melt. Place the soap strip filled mould into the warm oven. This is done to avoid pouring warm soap base onto cold soap strips which can result in the soap saponifying unevenly, leaving chalky patches or halo's around the soap strips. If the weather is warm and your soap strips and soap mould are already warm, you do not need to do this. Start to mix up your base soap. Once the soap reaches a thin trace, add the finely ground calendula petals and the scent combination. Blend until a medium trace is reached. The soap should still be nice and fluid but leaving definite soap trails when stirred. Pour the soap into your mould gently. You need to be careful to not disturb the checkerboard pattern. I like to have a skewer in hand to gently nudge any soap strips back into place should they move. Once all the soap is in the mould, thump the mould gently onto your table or counter to remove any trapped air bubbles. Insulate as normal and you're done!